When you rent an apartment at Crest Gateway Apartment Homes, you can revel in its ideal location with easy access to Charlotte’s best. Located between I-277, I-77, and I-85, your home brings you closer to neighborhood cafes, family-owned restaurants and a wide selection of beautiful parks. Explore the delicious cuisine of Alexander Micheal's shop at your local Harris Teeter or grab a decadent indulgence at Crave Dessert Bar, all less than five minutes away. Start your mornings with an iced caramel latte from Not Just Coffee or bike to Hazelnuts Creperie for a banana berry and cinnamon crepe. If you need a new outfit for date night, swing by The Metropolitan to shop at local boutiques. For an all-inclusive destination, head to Target or the newly established BJ’s. 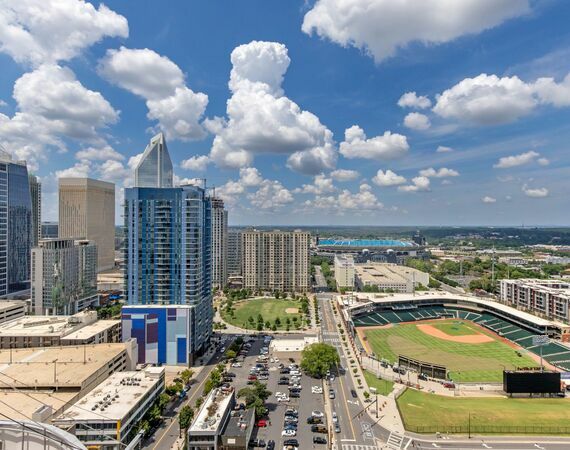 For entertainment, pick up a few tickets and catch a homerun baseball at the Knight’s BB&T Ballpark or taste test the local food trucks that frequent Romare Bearden Park.